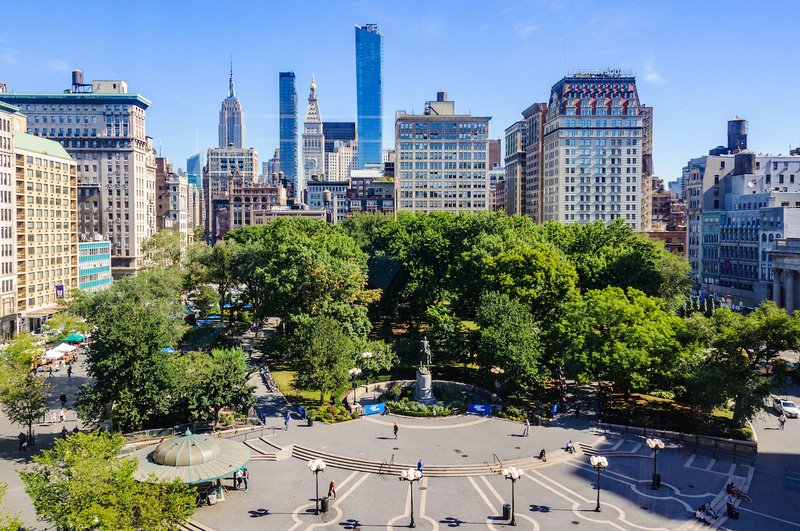 Here’s why we think you should stay within walking distance of Union Square, as opposed to Time Square in New York City. Most tourists seem to think that Times Square is the place to be for a city break in NYC. In all honesty, it’s expensive accommodation in pokey sized hotel rooms, noisy with traffic, ticket touts in the streets, and surrounded by mediocre chain restaurants. On the other hand, Union Square is a neighbourhood full of charm and centrally located. Some of the city’s best restaurants can be found in this location, which is full of charming places to eat. Stay near Union Square and you will get a real feel for living in NYC. In the afternoon & evening Union Square comes to life with couples out for a walk, friends meeting up, live musicians busking for tips etc. The farmers’ market (Greenmarket) is on Monday, Wednesday, Friday & Saturday with stalls on the northern and western edges of Union Square. In winter the festive Union Square Holiday Market kiosks can be found on the south western corner. Union Square has good transport connections, and is centrally located for the most visited tourist attractions. Unlike Times Square you don’t need to take a transfer train to reach the East side. Catch the subway 4/5/6 to the Upper East Side, the N/R subway for Downtown or Times Square and the L train to Brooklyn. Dining is a pleasure around Union Square, these neighbourhoods are more residential, rather than tourist focussed, which opens up a plethora of dining options. Here you can find local bakeries, bagel shops and cafes as breakfast alternatives to an American diner. For evening you are spoilt for dining out, ranging from food trucks to high class gourmet restaurants with every imaginable cuisine you could want. If you fancy a hotel room picnic, there are local delis and fresh produce shops to shop at, as well as take aways on the doorstep. For local snacks try Murray’s Bagels, Pasta Flyer, Breads Bakery, Rainbow Falafel, Coffee Shop, The Grey Dog, Union Fare Gastrohall, Taboonette and Kelloggs NYC. For a dining selection check out Gotham Bar & Grill, Bluewater Grill, Dévi, Rosa Mexicano, Village Taverna, 15 East and ABC Kitchen. Surrounding neighbourhoods include Gramercy, Flatiron District, East Village and Greenwich Village. Our suggested hotels for this area include Hyatt Union Square, W New York Union Square, Walker Hotel Greenwich Village, Freehand New York, The New York Edition Flatiron District, Lex Hotel NYC, The Standard East Village, The Marcel at Gramercy & The Marlton Greenwich Village. If you’re visiting on a budget have a look at the Chelsea Inn or Washington Square Hotel. For nightlife check out who’s in concert at the Irving Plaza, head to Webster Hall for the biggest nightclub venue in NYC, or the Daryl Roth Theatre as an alternative to a Broadway show.